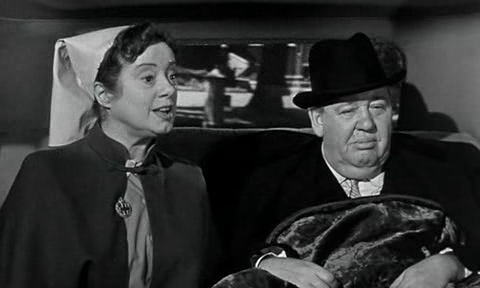 An ailing barrister (Charles Laughton) receiving full-time care from a nurse (Elsa Lanchester) reluctantly agrees to defend a man (Tyrone Power) accused of murdering a wealthy dowager (Norma Varden). 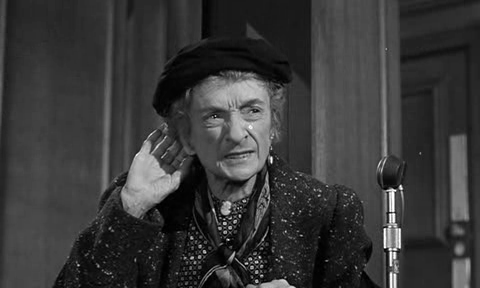 Peary boldly asserts — and I think I may agree — that “there is no courtroom drama more enjoyable than this adaptation of Agatha Christie’s play“, directed as a “high comedy” by Billy Wilder (who co-wrote the script with Harry Kurnitz). 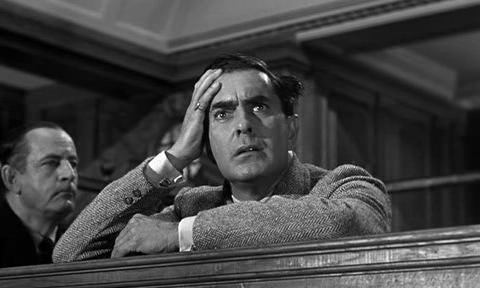 He notes that “like all Christie stories, this [one] has innumerable twists and a surprise ending”, and argues that “the most fun comes from trying to figure out if the obvious overacting by the defendant and witnesses is being done by the actors or by the characters they’re portraying”. 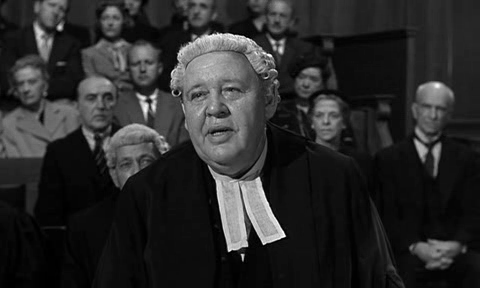 He specifically highlights Laughton’s central turn as “an aged London barrister with a heart condition”, noting that he “is just marvelous, making a difficult role — one which most actors (and you’d expect, Laughton) would have hammed up — seem easy”, and pointing out that “his comical scenes with wife Elsa Lanchester, who plays his doting nurse, are gems”. 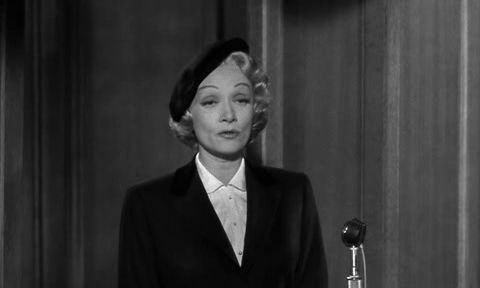 In addition to Laughton’s noteworthy performance, this “well cast” film features a host of fine supporting performances — including that given by Dietrich, who, “in her last strong movie role, seems comfortable working again with Wilder” (she starred in his A Foreign Affair back in 1948). Tyrone Power, meanwhile — in his final role before dying of a heart attack at the age of just 44 — is appropriately “foppish” in the critical role of Leonard Vole. Naturally, the less said about the plot of this gripping whodunit, the better. If you haven’t seen it in a while (and have thus forgotten all the many plot twists), you’re in for a treat; enjoy! Yes, as a top-notch murder mystery and courtroom drama. A must – for its place in cinema history, for the assured script and direction, and for the wonderful ensemble performances. I would agree that this could be the most engaging courtroom drama ever, peppered as it is with wit as well as sophistication. 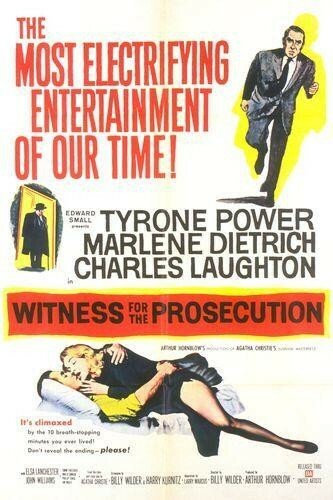 Not that there aren’t other courtroom dramas that are equally compelling (one of my personal faves being Lumet’s ‘The Verdict’) – but ‘WFTP’ is set apart, not only by its gentle(-ish) humor but by its twisting element of teasing suspense. 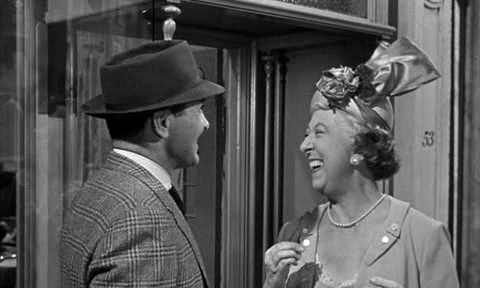 Wilder – in a change-of-pace quite unlike any of his other films – comes up with a real crowd-pleaser here, eliciting fine work from his entire cast – a cast that works solidly together as one in service to the story. I hadn’t seen this in a long time and, indeed, had forgotten its various twists and turns. It holds up rather well.